If you sponsor, hold and manage rodeos, you have a public exposure to liability that needs to be insured for your protection. Rodeo Events are mostly short-term, lasting from 1 to 10 days, though some organizations may sponsor more than one per year. They may be put on by a benevolent horse club or rodeo association, a school or college, a charity or a single or multiple community organizations like a Chamber of Commerce. But a sponsor may also be private individuals, horse businesses and ranch owners. Some are intended to make a profit, or raise funds for charity, and some sponsors only hope to break even. There is every level of rodeo competition from local less informal ”ranch rodeo” type events for working cowboys and ranch hands, to large national and international professional events. For insurance purposes, we define a Rodeo broadly to mean contests, games, competitions or exhibitions of cowboy or livestock and animal handling or controlling skills or activities wherein participants do or attempt to ride, rope, wrestle, race, tie, chase, control, contain and / or wrest an object from an untrained animal or an animal trained to perform in such events. The history of rodeo is interesting! Many rodeo events are based on tasks of cattle ranching, and the “cowboy” skills developed to fit the needs of terrain, climate and animals, with regional variations. The skills date back several hundred years to traditions of the Spanish Vaquero. Rodeo affairs of the 1820’s and 1830’s were informal events where cowboys tested skills against one another. After the Civil War, competitions became more organized with the first held in Cheyenne, Wyoming in 1872. The first pro rodeo was held in Prescott, Arizona in 1888. After that rodeos became public entertainment, sometimes combined with wild west shows and other types of exhibitions. By 1910, major events established in the western regions of North America. The most notable are Calgary Stampede, Pendleton Round-Up, and Cheyenne Frontier Days. Today numerous associations exist to develop, sanction, catalog points, and enforce standards for events; the first being formed in 1929. Associations exist to govern Children’s Rodeo, High School, Collegiate, Senior, Native American, Minority Groups, Ranch Rodeo, as well as Professional Rodeo for Men and Women. Rodeo sporting events are today very popular with spectators and participants. There are generally two basic event types – “rough stock” and “timed”. Pro-Rodeo events include: Tie Down Roping, Team Roping, Steer Wrestling, Saddle Bronc Riding, Bull Riding and Barrel Racing. Some organizations sanction Breakaway Roping and Goat Tying. Children’s events may include Mutton Busting and Cow Milking. Ranch Rodeo events test the skills of ranch hands on tasks common to ranch work. Large events may have fireworks displays and amusement rides provided by contractors. Rodeos usually open and close with a flag ride ceremony. Between events there may be a variety acts, trick riding, clown shows, horse drills, horse and wagon races, demonstrations, rodeo queen competition, and children’s competitions to entertain spectators. Barbeques, beer gardens, musicians, and dances are often held in the evenings. Wagon Rides, Pony Rides, and Petting Zoos may be on premises. Keep in mind that an Insurer may not be able to insure all the activities a rodeo sponsors or has on premises. In many instances, sub-contractors or concessionaires will carry their own insurance and be asked to list the Rodeo sponsor as Additionally Insured. These events require special facilities, such as a large indoor or outdoor arena with spectator seating of at least 500, and a primary location for EMT staff and parking of an ambulance. Also required are livestock pens, chutes and gates, larger livestock holding areas, unloading areas, and practice areas with high, sturdy fencing, and a property perimeter fence so loose animals cannot get into a roadway. Other space is required for parking by workers, participants, and spectators, camping, food service, and stalls for temporary horse boarding. Rodeo events can have several different types and levels of public exposure, but first and foremost they involve participants and several hundred to several thousand spectators. Most rodeo event and horse event liability policies exclude participants from coverage for Bodily Injury because rodeo activities are considered too dangerous to insure. While our policy provides coverage for participants in most horse events, it contains a rodeo participant exclusion. It excludes Bodily Injury to any person while practicing for or participating in “rodeo” or “rodeo” type events or in any event taking place at, during or in conjunction with a “rodeo,” whether the person is attending the “rodeo” as a professional, amateur or spectator. Spectator’s bodily injury and property damage are generally covered by the rodeo event liability policy, but not if or while they participate in a rodeo event. These are some other possible exposures as well: Advertisement of Events, Temporary Stall & Pen Contractors Livestock Contractors, presence of EMT and Ambulance Service, Parades on Public Streets, Trolley, Golf Cart, and 4-Wheeler Transportation to and from Parking Lots, Hired & Non-Owned Auto, Services Vendors, Fund Raising Raffles, Souvenir Sales, Food Service & Dining, and Beer & Wine Service or Sales (Alcoholic beverage sales are not insured under a General Liability Policy; Dram Shop / Liquor Liability Insurance is required. Most GL policies provide only Host Liquor Liability). Some sponsors own the rodeo grounds. But usually rodeo sponsors use Rented / Borrowed Facilities and Grounds. The property may be privately owned or a corporation, or may be public property, such as fair grounds, parks, public streets and parking lots. Rodeo sponsors may have employees and use volunteers. These additional exposures need to be insured also. Some can be insured under a policy or policies purchased in the name of the sponsors. But others, such as Livestock Contractors and Liquor and Food Vendors, should carry policies in their names and provide proof of insurance at an adequate limit to sponsors. Sponsors should consider being listed in those policies by name as Additionally Insured. If you sponsor numerous events during the year, you may want to consider an annual policy to insure all your events, and membership if a club, related business activities, because an annual policy may cost less and provide beneficial business operations coverage between events. If the sponsor is a horse business, an annual policy may be able to insure all your events and other services and activities under a Horse Farm, Stable & Ranch Owner’s Policy, or a Commercial Equine Operations Liability Policy. As an event sponsor, you worry that you may be sued or otherwise have a claim made against you for bodily injury or property damage by a spectator, guest, bystander, or someone else who comes in contact with the event and property. If sued, you will need to hire a lawyer to defend you and you wonder how you would go about doing this. If found negligent or responsible, you would likely have to pay for a court-ordered or agreed-upon settlement to the injured party. Fortunately, much concern can be relieved when you buy a Commercial General Liability Policy [GL] to insure your events. Commercial General Liability Insurance protects you from financial loss should a spectator, guest, bystander or a trespasser become injured [Bodily Injury] or their property is damaged [Property Damage] in relation to your operations, and they make a claim or file a law suit against you for damages. Holding a public rodeo event can be complicated and involve many people to assist, participate and spectate, and other businesses and organizations to provide services. There is the presence and use of horses and other animals in unfamiliar surroundings with a lot of activity and stimulus, and the presence of motorized vehicles of many types. Some animals can be dangerous if they get loose or out of control in a public area. Depending upon the type and size, rodeo event exposure ranks Moderately High. Factors that modify the risk are: Most rodeos are well-run with strong management by standards established of a sanctioning organization; emergency medical staff is on the location; and liability policies exclude bodily injury for rodeo participants due to the inherent risks. Most participants self-insure by their own life and health insurance. If it were possible for participants to be covered, the level of risk would be Extremely High, commanding a very high premium. A few Insurers may provide limited medical payments coverage and excess personal accident insurance for participants at limits from $1,000 to $30,000. Horse and animal activities are reasonably safe compared to many other activities people participate in. Yet, horse-human activities do carry inherent risks. Accidents do happen when people at different stages of capability attempt to touch, handle, train, ride, drive and control large animals that are unpredictable even when well trained. And some horse-human accidents are serious. Even with the best of intentions and management practices anyone can have a claim made against them and be sued. With the chaos and commotion going on at a rodeo, it is possible that people can get hurt while attending your event. You should have the right type of horse insurance to protect your business in case someone or an animal is injured. A spectator is injured when they trip over a rope or hole while walking around at the event. A spectator can become injured if he or she were to trip or fall from the seating area. Children commonly fall from bleachers. A rodeo animal can get loose and cause damage to property or injure guests. A rodeo participant’s horse could run away and get hit by a car. People could contract food poisoning while eating food at your event. These are just a few things that could potentially happen during a rodeo. There is no way to predict what could happen at any event, especially one involving animals and people. 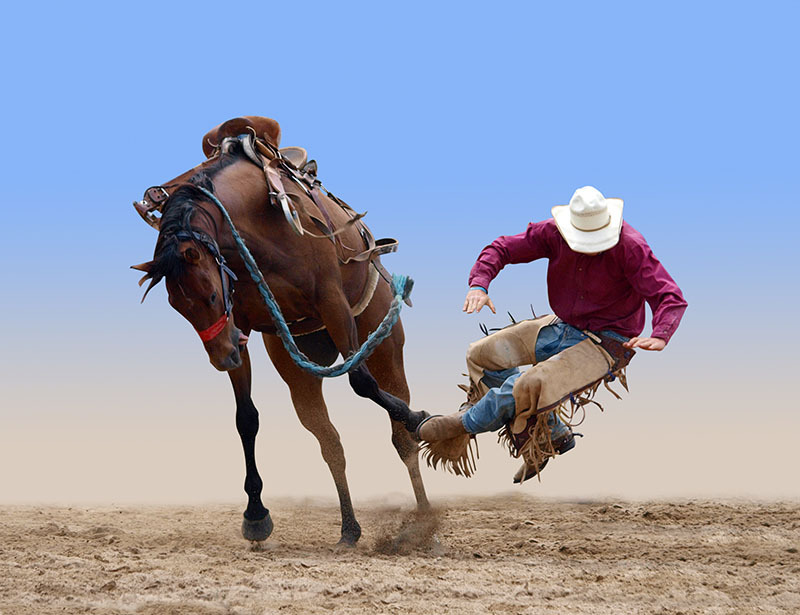 Prepare for the unexpected with equine liability insurance for rodeos. Inquire about our rodeo insurance policies and request a horse insurance quote to determine which rate is the best for your business.